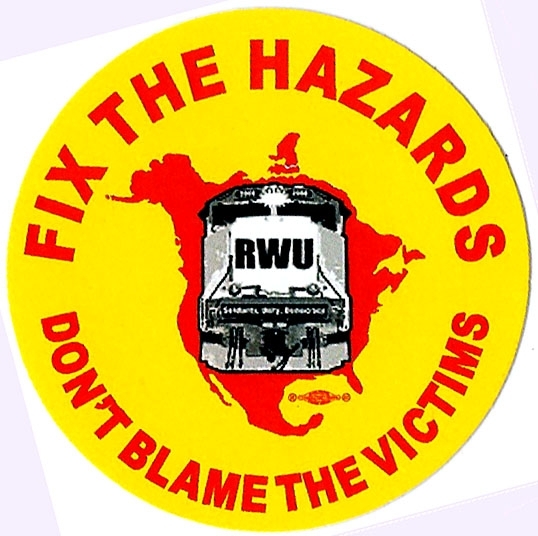 RWU Calls for a "Railroad Workers Memorial Day"
With the tragic death of Railroad Conductor Jared Boehlke on Mother's Day, May 10, 2009, the number of fatalities on the nation's railroads surged to a record pace for the year. In all, twelve rail workers had been killed on the job for the year and it was only half over. At the end of March, the Federal Railroad Administration (FRA) issued an appeal to all railroad organizations and employees for help in stemming this disastrous record. The FRA letter said in part, "If a culture exists whereby workers feel they are put in situations where they are making poor decisions for fear of losing their jobs, we must work together to change this culture. The elimination of fatalities, injuries, and accidents depends upon it. " RWU agreed with the FRA that something must be done to change the situation. RWU had actively campaigned for a safety approach that would put eliminating hazards first and foremost on the safety agenda for the nation’s railroads. Unfortunately, the rail carriers continued to emphasize worker behavior over hazard elimination. As a result, the carriers tend to downplay, overlook, or ignore altogether the problems and hazards that are created by management practices. Job cutbacks, job combination, and massive layoffs left too many rail employees working without the extra support and assistance needed in places like dangerous classification yards where Jared Boehlke met his death. Unfortunately, the carriers and the FRA are not the only ones who are focusing strictly on behavior-based safety programs instead of hazard elimination. Instead of helping us lobby the FRA for development of effective safety programs, our union leaders have too often become willing participants in the creation of “pilot” behavior-based safety programs. When rank-and-file members or locals ask for help in combating problems with local BBS programs, they defer their responsibilities to others. All too often it seems they are more connected to the carriers’ desires than they are to their rank-and-file members’ needs. Unfortunately, they often claim to be too busy to take the time to truly educate THEMSELVES about behavior-based safety programs. Railroad Workers United is asking its members and supporters across the U.S. -- and all rail workers that hear this call -- to wear a black shirt on the Friday of Father's Day weekend. RWU hopes that this relatively modest action will play a role in putting to en end any “culture” as the FRA described it where "workers feel they are put in situations where they are making poor decisions for fear of losing their jobs." From 2009 until 2016, RWU urged all of rail labor to consider officially demarcating Father's Day Friday to be, “Railroad Workers Memorial Day”, a day when all rail workers remember our brothers and sisters who have lost their lives working in the unforgiving railroad environment. NOTE: As of 2016, the RWU Steering Committee has approved changing the date of Railroad Workers Memorial Day to coincide with Workers Memorial Day, sponsored by the AFL-CIO and other U.S. unions on April 28th of each year starting in 2017.